fed to a policewoman. JT A /World Zionist News Photo Service. sein of Iraq exchanged smiles. migrated to Israel in 1950.
have reaped a large reward. and the Jewish Family and Children's Service. campaign to raise $12.5 million to build the new facility. slated to begin in the Spring. tion should not be "modest." for talks with Reagan on Dec.
take off from work or school. visit to the United States. verging on becoming a novel. to see my "adoptive family." ment of the trip. My "father"
plex of the Jewish Community Center. Area of the Jewish Federation Building. and Iran one of its most important allies. convenient way to tie up two potential foes. their traditional positions. In his U.N.
called for an end to the Gulf War. Iran is currently Israel's "bitter enemy,"
nually to anti-Israel terrorists in Lebanon. Israel's role in the sale of U.S. arms to Iran). security and lasting peace are achieved." tion and a staunch ally." Noting that U.S.
prove relations with Assad and Hussein. from which annual income for life can be drawn. Plan your gift to the Jewish Federation Endowment Fund. Jew,sh Federation of Palm Beach County. Inc.
out his KKK sheets to dry? a Klan without the robes. sought with Mayor Edward I.
support for an end to Iraq's war with Iran. to the calls for peace. the Joseph L. Morse Geriatric Center will be featured. show features Jewish music, comedy, and news. Federation, Jewish Education Task Force, 2 p.m.
Congregation Aitz Chaim, 9:30 a.m.
a.m. Jewish Community Center, "Jewish Book Fair"
Cocktail Party" at the Messing home, 4:30-6:30 p.m.
p.m. Yiddish Culture Group-Century Village, 10 a.m.
Federation, Planning and Allocation Committee, 6 p.m.
Council of Jewish Women-Palm Beach, board, 10 a.m.
Human Resource Development Meeting, 7:30 p.m.
Federation, Jewish Education Task Force, 7 p.m.
2,000 hours at the Center. the residents of the Jsepeh L.
A native of New York, Mr.
NEW DIRECTIONS IN CARING FOR THE AGED"
munity Plea For Soviet Jewry to be held on Thursday, Dec.
tional Conference on Soviet Jewry, will be the guest speaker. Semitism has its roots in Nazi ideology. tions of the United Nations. Red Cross in November 1985.
very hard period of our life,"
can't work (I don't have a job). will be delighted by this news. cessful, shooting will begin next year, first in the U.S.S.R.
live here 8-12 months of every year. is co-sponsored with Jewish tion, call 684-1991 or 844-4343. Honor your name, a friend or remember a loved one. The gift of Trees is perfect for weddings, births, Bar Mitzvahs. The permanent gift for any social or business occasion. Larger sponsorships available ... All gifts are Tax Deductible. 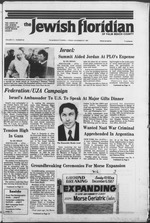 stitute, are (left to right) Erwin H.
of the 1988 Federation-UJA Campaign. result in a fatal split. latest crisis is a case in point. from the Middle East conflict. Arab League boycott of Israel. relations will do as well. not sell their vehicles in Israel. Burns, Leslie Adams, and Ellen Rampell. minimum commitment to the Campaign). Force. I have a "sister"
ty generated within the group. tremely well with the group. base on the border of Lebanon. ly are a big deal here." ing on caps and boxing them. ducts, I am filled with pride. rin; Carol Greenbaum, Women's Division Marilyn Winer. Reception Chairperson; and Elsie Leviton. I, Rixanne Axelrod, and Renee Tucker. gram are Olivia Tartakow, Shan Brenner. to bring Brunner to trial. was not in that country. Jewish community of the Palm Beaches. tions as well as representatives of the ticipated in the Presidents' Coffee. Other Presidents who attended the Women's Division coffee. ly as possible," concluded Mr.
cost in mind," concluded Mr.
ment is on an individual basis. proved of by the social worker. tion in the Soviet Union. to emigrate so far in 1987.
after they rang its doorbell. the Nazi SS to Demjanjuk. ple's Party of Arlington. VA.
the stunt as "guerilla theatre"
its antecedent in church law,"
vault him into the public arena. in the timing. The participants which "returned to Egypt." been simmering for 40 years. in the condemnation of Iran. sharply divided on the issue. states would soon follow suit. slam the peace door in his face. Continued from Page 1 -- ..
from the nearby school. They deadly force was justified. the main road in Gaza. Settlers my radio interview. h,ve ritual. We do not have prospects of a conference eve, *&& Zr cZSn had P*BSL wSTSoS! reminiscent of his KKKK days. territory. A curfew was impos- highway. ed on the Deir El Balah area. Vest Palm Beach area Oct.
of LTC for the aged. for Health and Social Services. American Savings Bank, Boutique. Refreshments. Cheese Breakfast served, at 9:30 a.m.
will be celebrated. Join them for "A Touch of Class"
presented by Fran and Marty Golden. on Monday, Nov. 30 at 1 p.m. at Temple Beth Sholom. Mrs.
Rose Rivkin will speak on "Jewish Humor." Okeechobee Blvd. from 9 a.m. to 3 p.m.
Israel, N. Flagler, W. Palm Beach. Won Israel and Soviet Jewry." Regency Spa, Monday, Dec. 14.
drawing, and talk by Dr. Michael Corry. Federal Grant Title III of the Older Americans Act, p! known as "the rich Jew." bage, the City and Death"
ty Center of the Palm Beaches. up a table and keep all profits. iitable means for a peaceful. every entrance to the building. ty members who are here." ed by co-chairmen Robert S.
phrase. This greatly purchase is $25,000. Abu Nidal terrorist organiza- Israei Bonds annually." man of the Israel Bonds Dental Division. that the protests were unfair. presented on Dec. 23 and 30. County Road in Palm Beach. that her daughter is Jewish. For times of evening services please call the Temple office. Methodist Church. 6513 Dillman Road, West Palm Beach 33413. Mehler. Services Friday 8:15 p.m.. Saturday 9 a.m.
33418. Phone 694-2350. Rabbi William Marder. Cantor Earl J. Daily Minyan 8:15 a.m.. Sunday and legal holidays 9 a.m.
Morris Pickholz. Cantor Andrew Beck. Parkwalk Drive, Boynton Beach, FL 33437. Phone 736-7687. 287-8833. Rabbi Benjamin Shull. Services Friday evenings 8 p.m.
services 8 p.m., Saturday morning 10:30 a.m. Phone 335-7620. 747-1109. Services Friday 8 p.m. Student Rabbi Elaine Zechter. Monday, Dec. 7 at 9:45 a.m.
take place on Tuesday, Dec.
Wednesday, Dec. 2, 12:30 p.m.
of latkas etc. will be served. Benjamin "Bucky." 78, of Covered Bridge. Guardian Chapel, West Palm Beach. ( hapel. West Palm Beach. next meeting on Monday, Nov. He will speak Sunday, Dec.
talk cost $6 per person. Schwammberger's living place jn the camp." police were closing in on him. inmates on a weekly basis,"
^iML Nov. 27 5:09 p.m.
dent at Roosevelt Junior High. Temple office as a secretary. Torah as a Bat Mitzvah. morning, Nov. 28 at 10:30 a.m.
Menorah Pre Need Funeral Plan. Coalition to Free Soviet Jews. he met last month in Moscow. Study Group for 15 years. munal and philanthropic life. They succeed Norman D.
Cohen, who becomes chairman emeritus.